Mrs. Kader participated in a two days International Conference on the theme "Arab Geopolitcs in Turmoil" organized by the NATO Defense College Foundation in cooperation with the Gulf Research Center Foundation, NATO Science for Peace and Security Programme, the NATO Defense College and the University of Jordan at the Auditorium of Via Veneto in Rome. 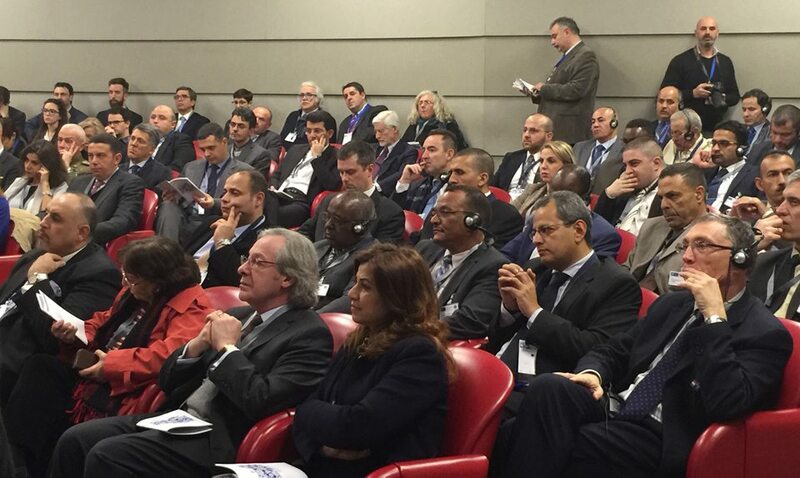 The conference, which was introduced by the Chairman of the NATO Defense College Foundation Alessandro Minuto - Rizzo and the Commandant of the NATO Defense College Janusz Bojarski, was attended by representatives of the diplomatic, political, military, academic Italian and foreign world, in particular by authorities of the Arab countries such as the former secretary general of the League of Arab States, HE Amre M. Moussa, the former Prime Minister of Libya, Mr. Mahmoud Gebril, the former Egyptian Ambassador to NATO and EU, Amb. Mahmoud Karem, the Deputy Minister of Yemen, Rashad Al Alimi, the Chairman of the National Security Bureau in Kuwait City, Sheikh Thamer Ali Al-Sabah. The Middle East is facing with several issues: regional divisions, civil wars, the growing power of terrorist groups and other non-state actors, humanitarian crises. At the base, there are ethnic and religious causes and the struggle for control of resources. After Lebanon, other countries in the Middle East are now subject to a risk of disintegration because of the ISIS terrorists and other centrifugal forces. The exclusive use of military assets has testified that , in the past and today, it is not the ideal instrument to solve this type of conflict, which require effective political cooperation among the international community in order to elaborate a shared project that ensures stability and security in the region, focusing first of all, on the educational system and culture in the Arab world. Following the intervention of the Director of the Department of studies on terrorism and national security of the Gulf Research Center in Jeddah, Mustafa Alani, who spoke of all the forces fighting Daesh and dangerousness of Daesh, Mrs. Kader took the word by pointing to Dr. Mustafa had forgotten to mention the Kurdish peshmerga forces that are the only ones on the field to fight against Daesh since two years along 1,050 km and they make them available to both the government of Iraq and Syria for the liberation of territories outside their territorial jurisdiction. In this situation, the central government in Baghdad, not only does not support the Kurdistan Regional Government at the military level but not even send, since two years, the budget provided for by the Constitution of Iraq. Despite these difficulties, the Kurdistan Region is hosting 1.8 million people, including refugees and displaced persons, without distinction of ethnic - religious affiliation.